← So, What’s It Gonna Be, Ladies: Denzel in Hat, Glasses, or Both? Satisfy Your Cravings With This Handy Guide! Powerfully Leading the American Axis of Awesome. Washington vs. Tiger, above, is a digital painting by artist Jason Heuser, aka SharpWriter. 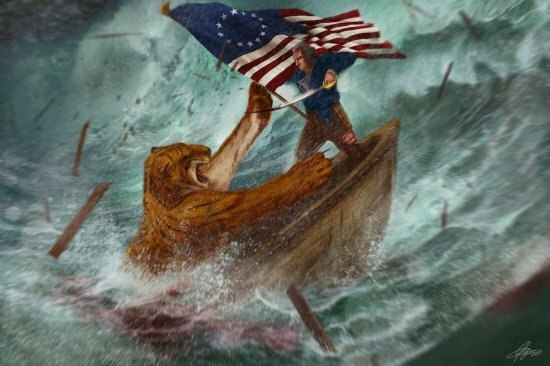 It imagines our first president defiantly battling a ferocious Bengal beast from the aft of a disintegrating boat…in the middle of what must be a Category 5 hurricane. Right. If this doesn’t say everything you need to know about the United States of America, I don’t know what does.